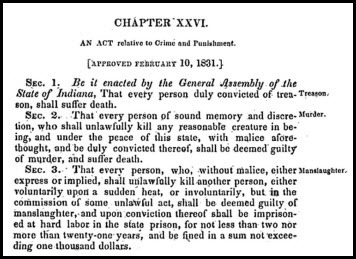 In anticipation of this weekend’s Genealogy & Local History Fair at the Indiana State Library — a whole day focusing on “Crime and Punishment in Indiana” — The Legal Genealogist spent some time last night poking around in the early laws of the Hoosier State to see just what sorts of things our Indiana ancestors might have gotten themselves in trouble with. That makes sense, especially in an early agrarian economy. Doesn’t seem quite fair, does it? Oh, and come on out on Saturday to the Genealogy & Local History Fair at the Indiana State Library in Indianapolis! I’ll be speaking about researching your “black sheep” ancestors and using court and prison records, and Kevin McQueen — author of Murder and Mayhem Indiana, Strange Tales of Crime and Murder in Southern Indiana, and other books about Hoosier true crime stories — will be speaking about the strange stories and crimes he has researched while writing his books. Years ago, I found microfilmed copies of police/court records at the Greene County Courthouse. And, yep, there were my ancestors. Convicted of gaming/gambling and rioting. Sounds like the older idea of rioting isn’t quite what one would picture in today’s world, and would be much easier to get charged and convicted for it back then. Definitely an easier crime to commit earlier rather than today! !